Bejot studied at the Academie Julian in Paris and learnt to etch with Henri-Gabriel Ibels in 1891. 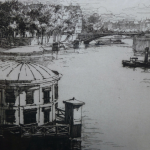 Béjot’s technical skills were already apparent in his 1892 first commissioned series, La Seine a Paris. He then firmly established his reputation with his widely acclaimed La Samaritaine, which was exhibited at the Peintres-Graveurs exhibition in Paris in 1893. In 1908, he was elected to the Royal Society of Painters-Etchers and Engravers in London. He also became a Chevalier of the Legion of Honour in 1912.